Here’s the good news: What you do today will pay off 6-12 months from now… if you do it right. In this episode I’m talking about the difference between marketing ONE webinar funnel and marketing your whole business. Tune in to this quick episode for real life examples for how I market my own brand, the script we share with first-time partners (i.e “you might not see a return on investment in the first month!”), and a mini-rant against Bro Marketing. Remember to share your takeaways on IG stories and tag @emilyhirsh for a shoutout! [7:39] A webinar funnel is not a business! Stop focusing on making your million $$ from that. 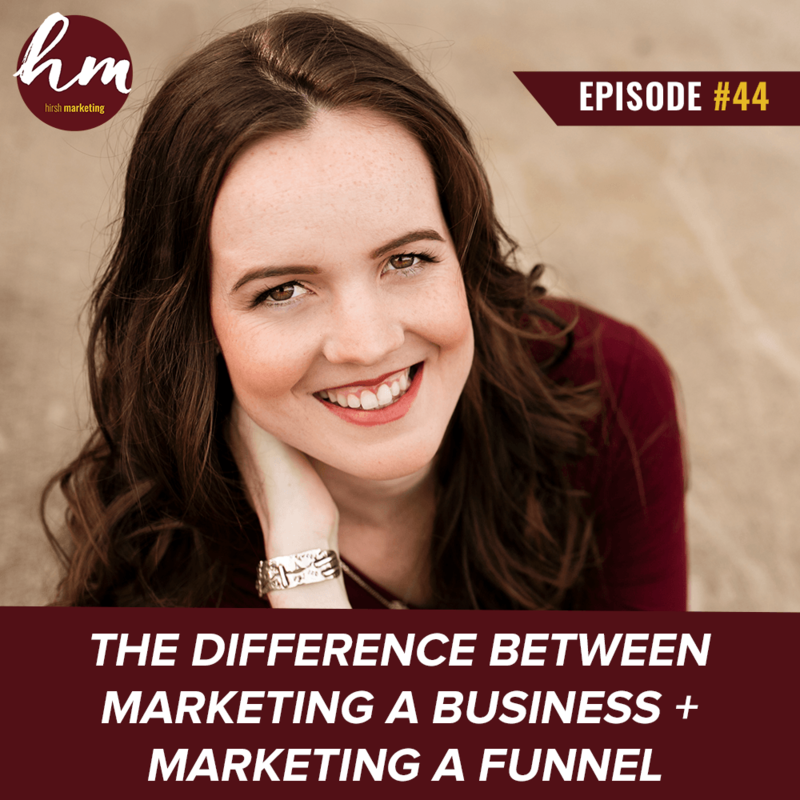 In today’s episode I’m going to talk about the difference between marketing a business versus a funnel. So, I have been crazy busy the last two weeks, speaking at an event in San Diego, and then I had a Mastermind Event where I live now in Austin, and just been around a lot of entrepreneurs. Super socialed out, introverted me. But a common a theme keeps coming up with people, and the way that they see marketing versus the way I think our team sees it, and what I stand for with marketing. And that is, that I really believe marketing has to always be looking at the big picture, and looking at the long game. So, what you market today will pay off if you do it right, and you’re consistent, in six and 12 months from now. And it is, because I’ve see it. Not only is it a value for me because I think it’s important to connect with people, but I actually believe that business is built off of that. Everybody I’ve seen behind the scenes, you know, my seven plus figure, seven-, eight-figure clients who are successful, there’s this one common theme, always, and it’s that they care about connecting and value with their audience. So, what do I mean, like the nitty gritty of this? I mean that when you run ads, and when you’re marketing, and when you’re looking at your marketing plan, and you’re planning out your business, I want you to think about not just your cost per lead, and how you’re going to get leads in your funnel, and how are you going to get people to watch your webinar, and buy your course, or buy your service. But also, how are you going to get people to notice you? How are you going to build your brand, how are you going to build trust, how are you going to build a name out there? And so, we work with mostly influencers whose big goal is build their name, and build their influence out there in the online world, or the entire world. One way to do that, and what you have to do to make sure that you do that, is consistent value content. I mean videos, podcasts, anything that’s free. But the key behind it is also, it’s free, it’s value content, but also it needs to be you, it needs to really speak your message. You’ll hear me, when I speak in my podcast, I’m on fire. I have something to say, I have an opinion, I know my audience, I know who I’m talking to, I know who I’m not talking to. I’m not trying to please everybody, I’m trying to build this trust and this following from a specific group of people. And then what happens is, over time I have followers and people who have been following me for a year and they’re ready to work with me. And so, if you are building a business, one of the biggest keys to success is marketing it as a business, and that means putting money, and time, and effort into consistent, valuable visibility and brand awareness content that’s pure goal is to just build your name, build your following, build trust with your people out there, and it will pay off as a snowball effect in the long run. Where I see people fail with their marketing is that they build a webinar funnel, and they’re like, “I have no money, and I have to make this webinar funnel work, and so I’m going to spend $500 on my webinar funnel. I have no following, no trust out there, and I’m going to spend $500, and I have to make that $500 back in a week because this is how I’m going to pay my bills.” If you know one scenario where that worked, tell me, because I have seen that work, ever. Because, why would somebody come into a webinar where you have no credibility, no testimonials, no following, and just be like, “Yeah, I’ll buy their thing.” And so, the gap is that people don’t value, or that a lot of people in their business are looking at their marketing through very narrow eyes of only looking at their funnel. When you look at big businesses, and you look at big influencers, and people who have seen success, the common theme that you’ll see is they treat their marketing as a whole, their whole business. So, there’s a very good mix of value, brand awareness, visibility, lead generation is mixed in there, and then sales. It’s not just sales, and offer, and pound people with your offering, and “buy from me,” right? Especially today, in 2019 people are sick of it, they are so sick of it. So, when you’re planning your marketing, looking at your marketing, always bring this in mind and take a step back. If you do that consistently for many months in a row, and you’re consistent, like, weekly content, you’re always putting it out there, you are always showing up, people can’t escape you in the feed, and your content is good. Like I said, it’s speaking to your people, it has passion, it has reason, it’s polarizing a little bit, you know who you’re talking to and who you’re not talking to … and the content is good. So, I want you to look at it as, “Am I marketing and building a business, or do I just care about my funnel?” Because a webinar funnel is not a business. Webinars work, yes they do, 100%, which is another episode I’m going to do is, do webinars still work? But, webinars work, but they’re not your whole business, your business is not your funnel. Your business is your team, and your messaging, and your ideal client that you’re trying to, or your customer that you’re trying to attract, and your branding, what you stand for, and your values. All of that comes together, and that’s your business, and what you’re selling obviously is in there, but you have to value the business as a whole, and you have to see your marketing as a long game, big picture strategy. And that’s one of our number one values in our company. And then we lay it out. But I will never over-promise. Marketing is hard, building a business is hard, building a brand is hard, getting people to pay attention in this noisy world is hard. It takes consistency, and value, and somebody to really commit to the long game. So, that’s my little mini rant today, because I’ve had this conversation so many times. I think it’s such a symbolic thing in how people have the wrong idea because of what’s been taught out there, what people are sharing, like their “one webinar funnel to a million dollars,” but what you don’t see is all the backend brand awareness, and connection, and visibility that they did to get there, and you have to weigh those and take that into consideration as well. So, if you want a custom strategy, if you want to work with Team Hirsh, we are the best marketing team in the influencer space, I will say that with such confidence, go to HelpMyStrategy.com and apply to work with our team this year. Thanks so much for listening guys.